Vivek Pawar is the Founder and Chief Executive Officer of Sankalp Semiconductor Pvt. Ltd , which he founded in 2005. Sankalp has grown from 6 employees in 2005 to 100+ employees focused on niche area of analog and mixed-signal IC design. He brings in 20+ years of industry experience in varied functions like general management, operations, program management, customer relations, and design. Vivek also has significant experience in mixed-signal and analog product design and system on chip (SoC) development, including firmware development. 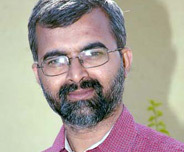 Prior to Sankalp Semiconductor, Vivek served as Program Manager at Texas Instruments Inc. (Houston, USA) from 2003-2005 and General Manager for Broadband Silicon Technology Center in Texas Instruments India, Bangalore from 2000-2003. Vivek has 3 patents approved and multiple publications to his credit. A significant project in Vivek’s experience was for developing a DSL router on a single chip which took Texas Instruments to the number one position in the CPE DSL market. That product also received the 2003 EDN Worldwide Innovative ASSP Product of the Year Award. Vivek received his Bachelor’s from COEP, Pune and a Master’s from Indian Institute of Technology (IIT) Kharagpur, India.